Grohe Sensia Arena ... inspired by Japan’s high standards in hygiene culture. Grohe demonstrated its leadership in innovation, design and smart technology when it took up an entire hall of a major international exhibition centre to showcase its kitchen and bathroom systems that seamlessly combine these elements. Gulf Construction was amongst a selected few to be given exclusive pre-launch access to the entire range of new Grohe products launched at ISH 2017, the world’s leading trade fair for bathrooms, energy, and air-conditioning technology, held in March in Frankfurt, Germany. Part of the Japanese Lixil Group, Germany-based Grohe showcased everything required for a modern-day home, including smart shower toilets, smart controls and a shower for the bathroom; various faucets for the kitchen; leak detectors; and, for the first time, entire bathroom solutions, including ceramics and accessories. A major highlight of its showcase was the Grohe Sensia Arena, an intelligent shower toilet that draws inspiration from Japan’s high standards in hygiene. Redefining cleaning, it is one of Grohe’s most striking inventions over many years, says Christian Baum, chief financial officer, Grohe East Mediterranean, Middle East and Africa. 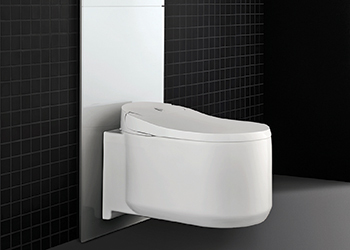 The shower toilet uses technology form Japan and its minimalistic design was created by Grohe’s in-house designers. The toilet seat does away with bidets, freeing more space in the bathroom. It has a super-advanced disinfection process that guarantees it is 99 per cent bacteria-free. The quality of the ceramics used also guarantees zero bacteria. Its special flushing cistern element sits behind the WC and is concealed in the wall. The Sensia Arena has two different sprays for massage and hot spray. An invisible air curtain flies above the water to hold back the odours. The toilet shower can be accessed in three ways: by a portable control unit, through basic side controls on the seat or by smart devices using a special app. Grohe is in talks with major spas and hotels in Dubai, UAE, to convince them to install the Grohe Sensia Arena. Antoine Khalife, Grohe vice-president for Levant and Saudi Arabia, says the product has been shown to many target groups in the Gulf and has received a tremendous response. Aquasymphony ... an orchestra of water. “The concept started in Japan but it’s slowly finding its way into Europe, the Americas, the Middle East and Africa,” Khalife says. Grohe SmartControl: Radio controls inspired Grohe designers to come up with a system that uses a button to switch the shower on and off and a knob for the volume of water. Called the SmartControl, these two elements replace the traditional lever – which can sometimes confuse one about the head and hand shower – and make the showering experience easier. “A thermostat regulates the temperature so you don’t burn yourself when someone else is using water elsewhere in the home, making it safe for kids alone in the bathroom,” says Baum. The SmartControl’s technology is concealed in the wall, and its 350-mm-wide head shower and hand shower comes in one stylish package. 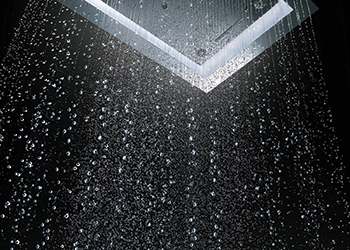 Aquasymphony: This intelligent and intuitive shower orchestrates water in wonderful shapes and forms – and as delicate as a sea mist or as invigorating as a waterfall. It combines the elements of water, light, sound and steam to give users their own spa. The showerhead is huge at 1 by 1 m and an intelligent control system offers the option to select from seven different shower experiences. The Aquasymphony can be programmed using smart devices. Grohe Blue Home: This innovation can be called a friend of both the family and environment. It replaces the regular kitchen faucet with one that provides chilled and sparkling drinking water directly from the water line using a high-performance filter. “It’s a saving in the long run as you don’t need to buy bottled water,” says Baum. The conversion box contains two cans, one for carbon filtration, which lasts for over 3,000 litres, and another containing carbon dioxide (CO2) which lasts for 70 litres. The spout has different inlays that keeps the normal water and filtered water separate. Grohe Sense Guard ... complete security. He says the Dubai government has shown interest and wants to work together with Grohe to reduce the use of plastic bottles. There is an alternative for the Grohe Blue called Grohe Red for use in colder countries where hot water is used, and for professional kitchens. 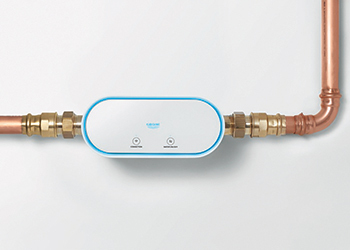 Grohe Sense + Sense Guard: Water leakage is an underestimated danger that can cost residents thousands of dollars. Grohe Sense and Grohe Sense Guard aims to provide complete water safety 24/7. Grohe Sense, which can be placed anywhere in the house, can detect leaks on the floor, sense humidity and temperature, and detect frost risk. Grohe Sense Guard, on the other hand, detects burst pipes and stops water flow instantly, senses water pressure, temperature and flow, and tracks consumption. It allows real-time monitoring with the Grohe Ondus app on smartphones. Among other products, Grohe offers classically elegant Grohe Essence and Lineare faucets; flush plates; and glass covers for concealed installations. The company is now moving towards becoming a complete bathroom solutions provider, and in the future will be providing shower trays and ceramics, taking advantage of Lixil’s know-how, and thus steadily expanding its portfolio. The partnership between Grohe and Lixil has helped both companies. While Grohe’s expertise is unrivalled in bath mixer and shower technology, Lixil is a leader in shower toilet technology, says Khalife, adding that the partnership has positively impacted their culture of innovation. Grohe also making giant strides in social initiatives. All Grohe products are systematically designed to save water (by up to 50 per cent) and energy so that natural resources are conserved. “These products, equipped with water-saving technologies, offer the perfect water experience without the need to compromise. Reducing water and energy consumption goes hand in hand with convenience and attractive design,” says Baum. Grohe’s EcoJoy line is one such product and as part of its corporate social responsibility (CSR) in the Middle East, Grohe is installing EcoJoy faucets at select mosques for free. Whatever is saved as water is donated as food back to society in the “Turn water into food” initiative. Meanwhile, in Bahrain Grohe is co-ordinating with local authorities to educate and create awareness: “We are pushing with consultants and architect to have these water-saving features standardised as part of the specifications,” says Khalife. Grohe is now partnering with Dubai Sustainable City to fit the new residential community with award-winning sustainable designs. All products installed reduce water consumption, and combine economic, ecological and safe use of water with excellent design. These include the Tempesta shower head and hand shower, Concetto, and Eurocube faucets. Meanwhile, for the Mövenpick Resort El Quseir in Egypt, Grohe’s high-end product ranges have been selected including its exceptional Lineare basin mixers with the SilkMove technology, Lineare shower mixers, and Rainshower Solo showers. Additionally, the bathrooms will be equipped with accessories such as the Allure toilet paper holder and towel ring.